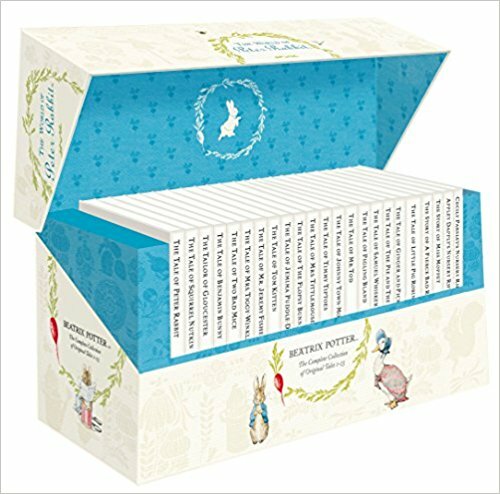 The Tale of Peter Rabbit by Beatrix Potter is a classic children’s book beloved by children and parents everywhere. 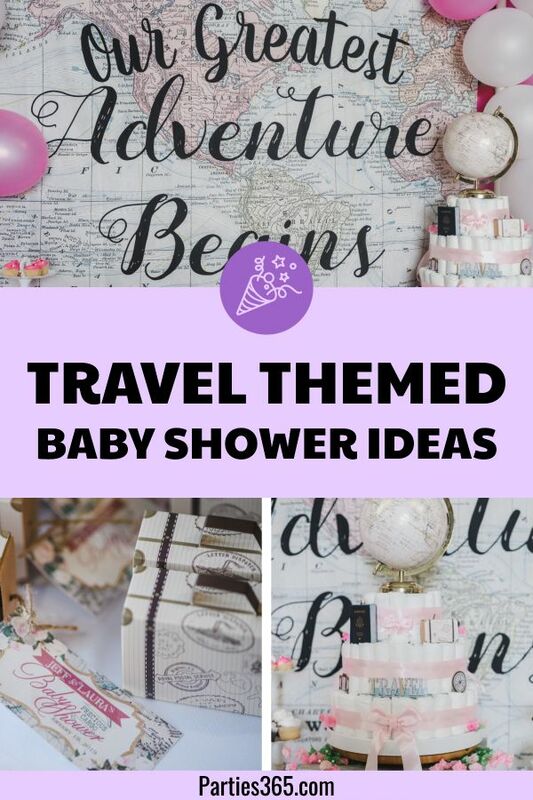 Pulling inspiration from one of your childhood favorites is a fabulous way to pick a theme for a baby shower. 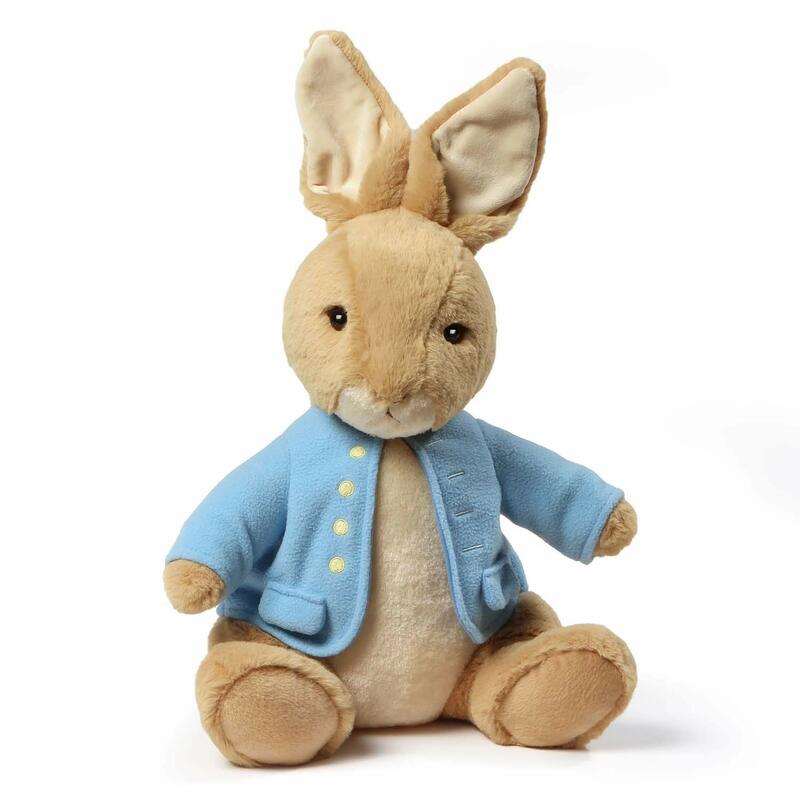 In the case of expectant parents Alex and Peter, it was the perfect fit as their family and friends threw them a lovely Peter Rabbit Baby Shower for their soon to arrive son. 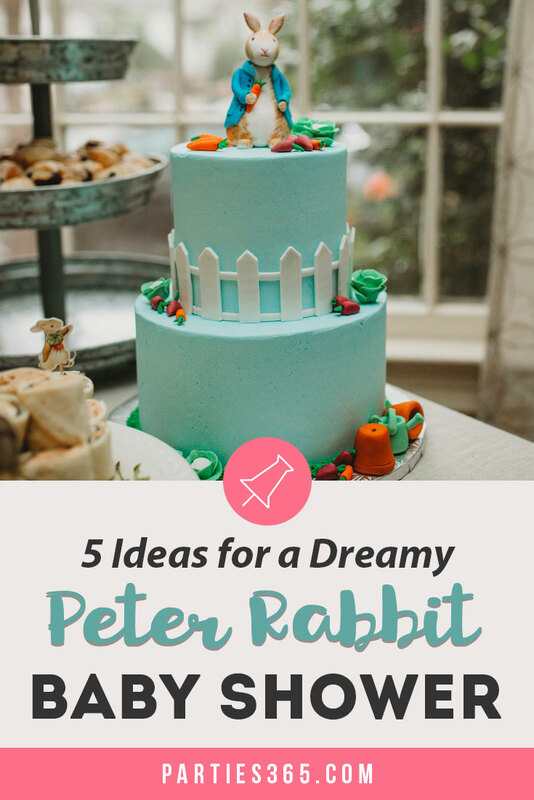 Join us as we take a look inside their party and highlight 5 ideas for a dreamy Peter Rabbit Party of your own! 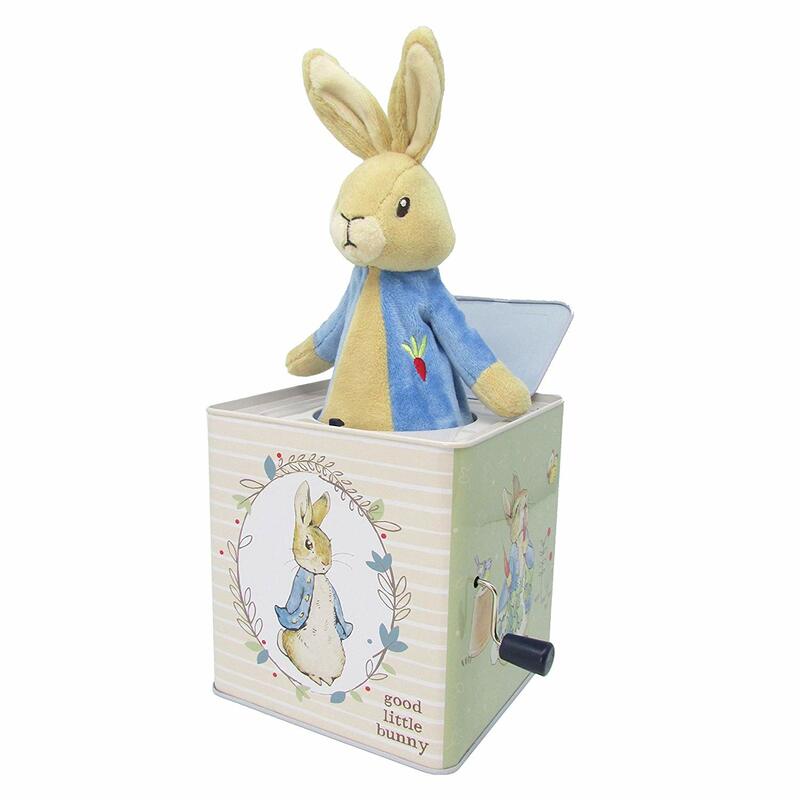 Plus, see our baby shower gift ideas, perfect for this classic storybook tale. 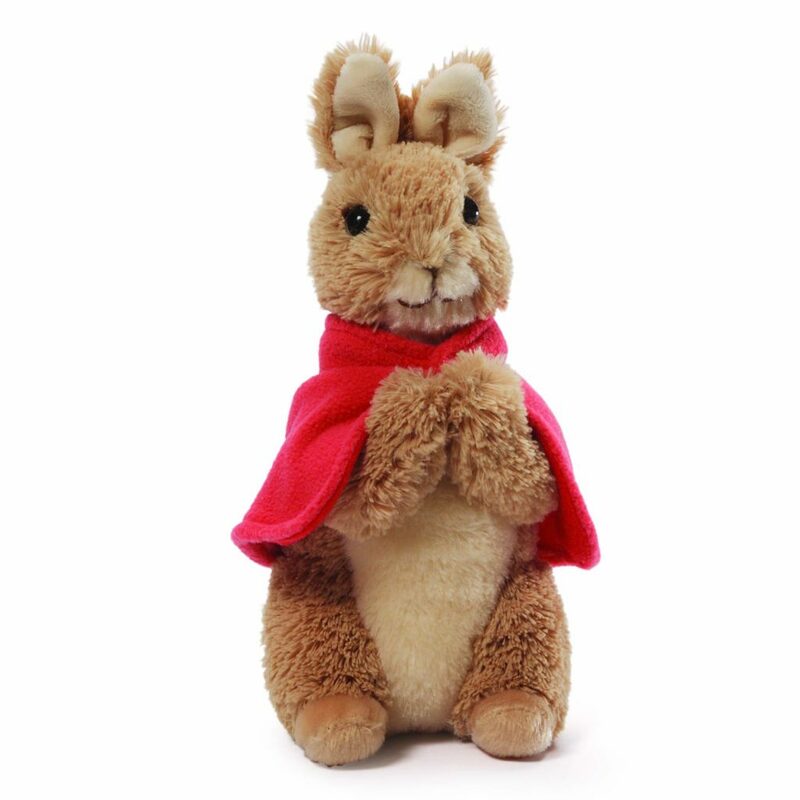 The Tale of Peter Rabbit tells the story of a mischievous rabbit who experiences trouble in Mr. McGregor’s vegetable garden before narrowly escaping and safely returning home. 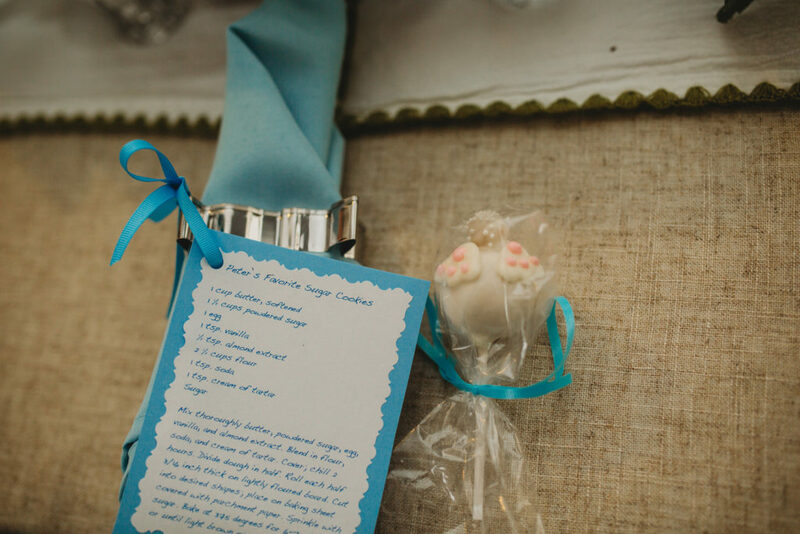 I love how expectant father Peter’s mother saved many of his childhood toys and used them for decor, highlighting many of the special moments in the book. 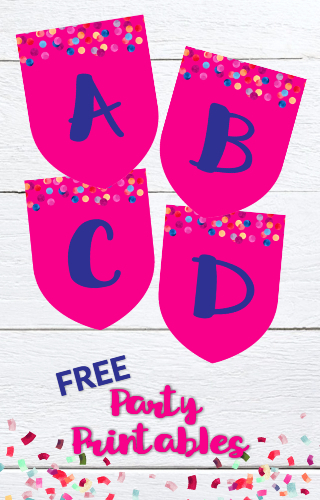 Here are several ideas you can recreate for your party too! 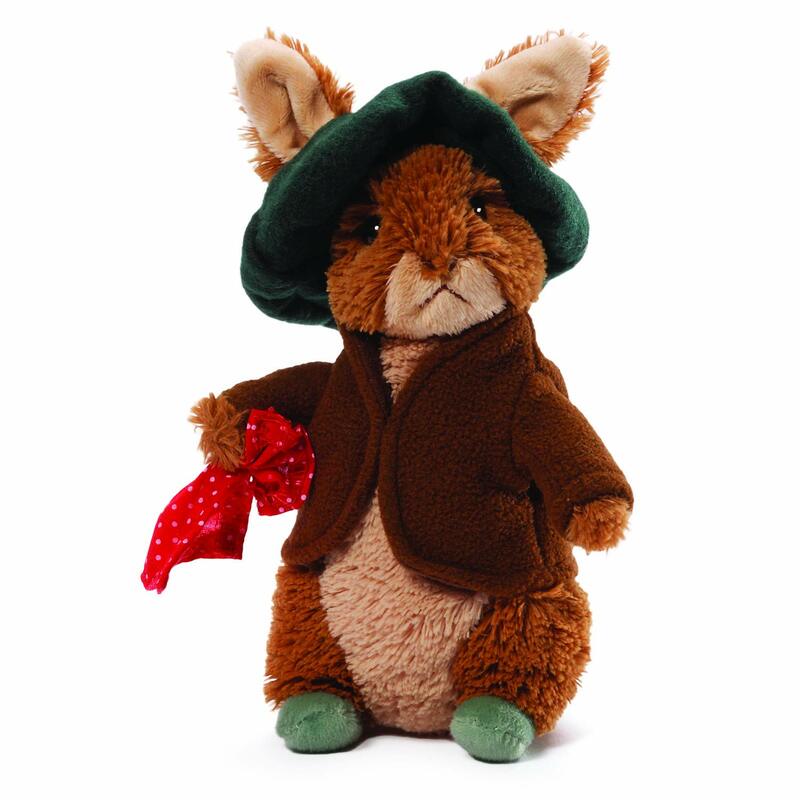 You’ll likely remember after the little rabbit escapes from the garden, Mr. McGregor uses his jacket to create a scarecrow in the garden. 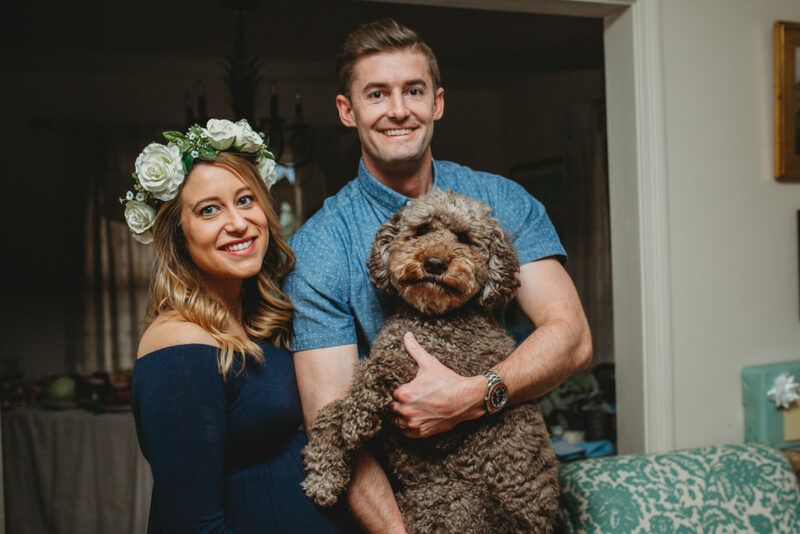 What better way to welcome guests and set the stage for what’s inside, than creating your own scarecrow by the front door! 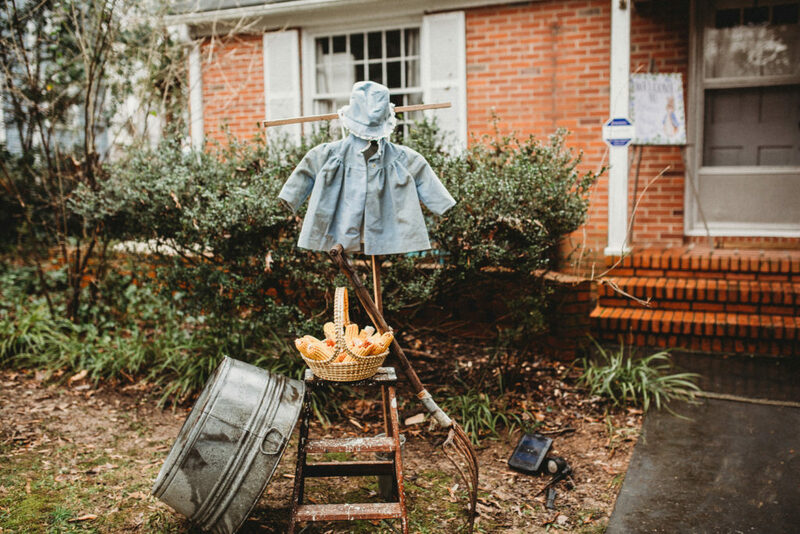 Using some of the father-to-be’s baby clothes, they set up a scarecrow complete with pitchfork and a basket of corn! 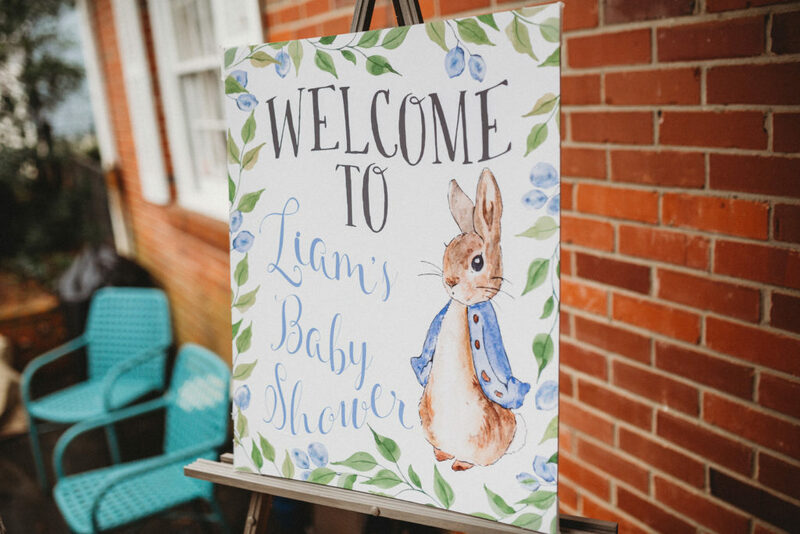 On the front porch, guests were greeted with a custom Peter Rabbit Welcome Sign too. 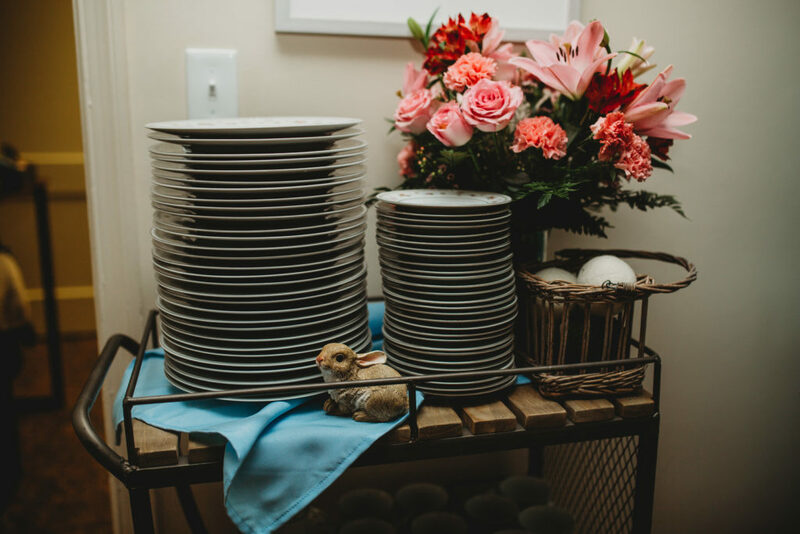 Small touches like these really make a difference to your guests and set the mood for a great time! Another great way to incorporate a children’s book into your decor is to use the setting of the story. 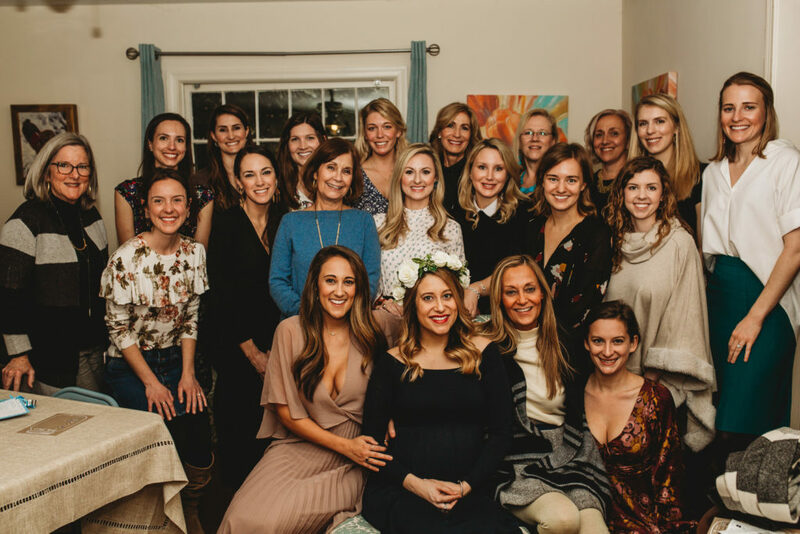 In this case, the story takes place in Mr. McGregor’s vegetable garden, and that was the clear inspiration for the table of food at the baby shower! 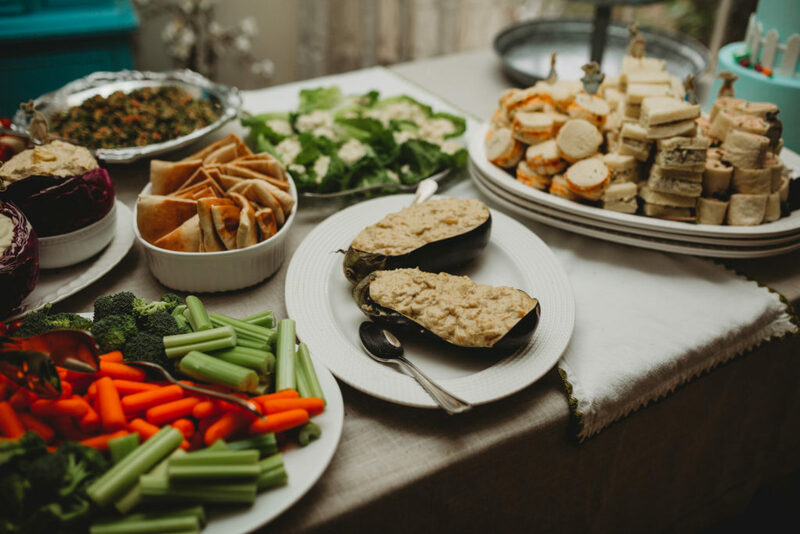 Focusing on vegetable trays and utilizing vegetables like eggplants and cabbages as serving dishes was a brilliant way to bring the vegetable garden to life! 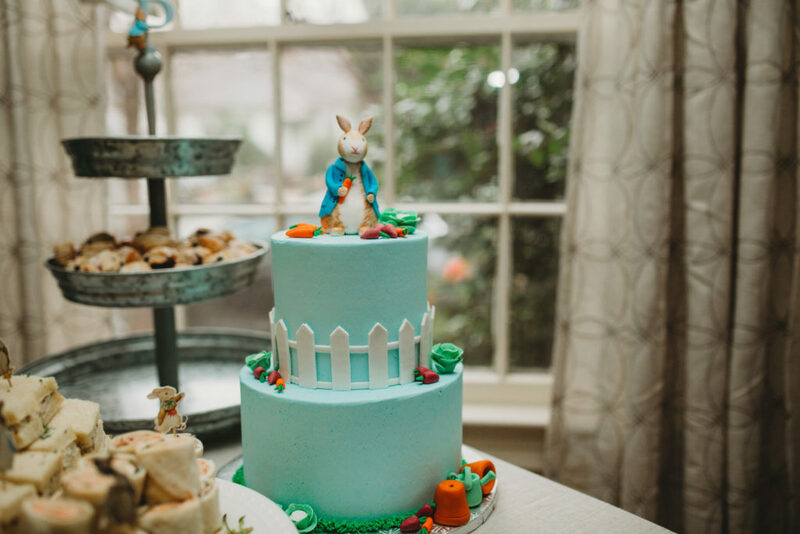 If you recall, there’s a moment in the story where Peter Rabbit runs into a shed and hides inside a watering can… and that’s why we adore the centerpieces at Alex and Peter’s baby shower! The watering cans were interspersed on the tables with small potted plants and antique-like gardening tools. 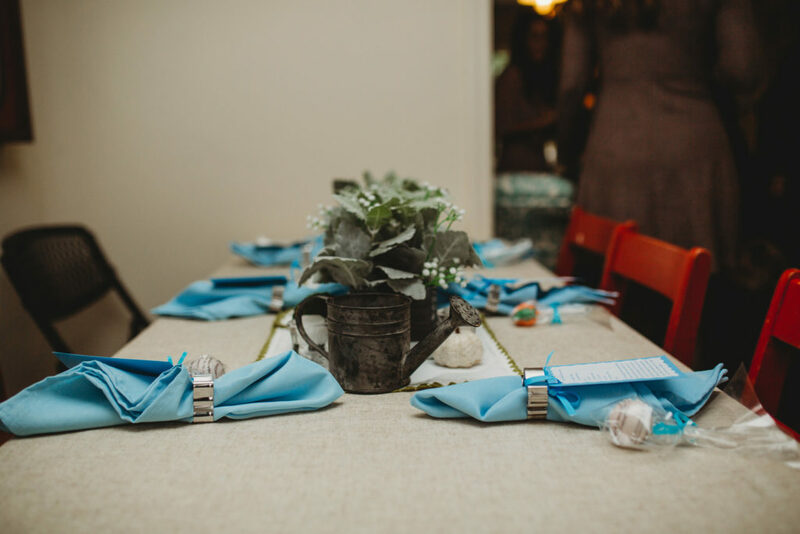 You could also use some watering cans as your flower vases and put some lovely seasonal blooms in them on the tables as well. They used a lot of galvanized metal decor pieces to get a farmhouse feel for this shower and you could recreate that by using small galvanized planters like these along with small galvanized watering cans. 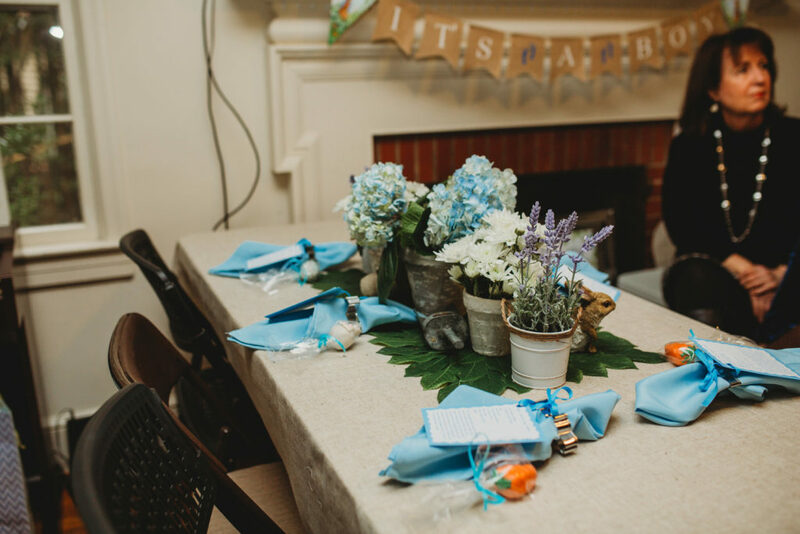 The grandmother-to-be really outdid herself adding in family keepsakes throughout the party. This is a lovely way to personalize a shower, keeping the focus on family and giving it a more intimate feel. There are several ways you can incorporate vintage details in your decor depending on what items your family has kept. 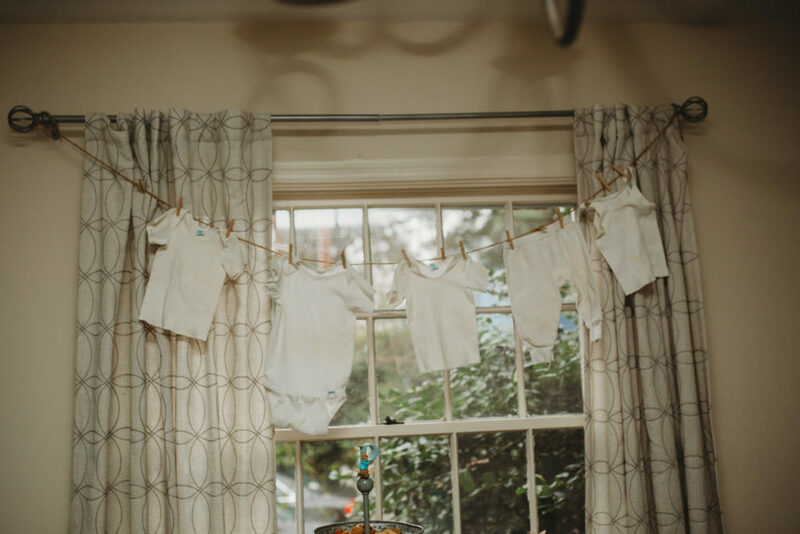 For example, if you have some old baby clothes (or you could use new clothes for the baby), you could hang them like Alex and Peter did as a bunting banner. 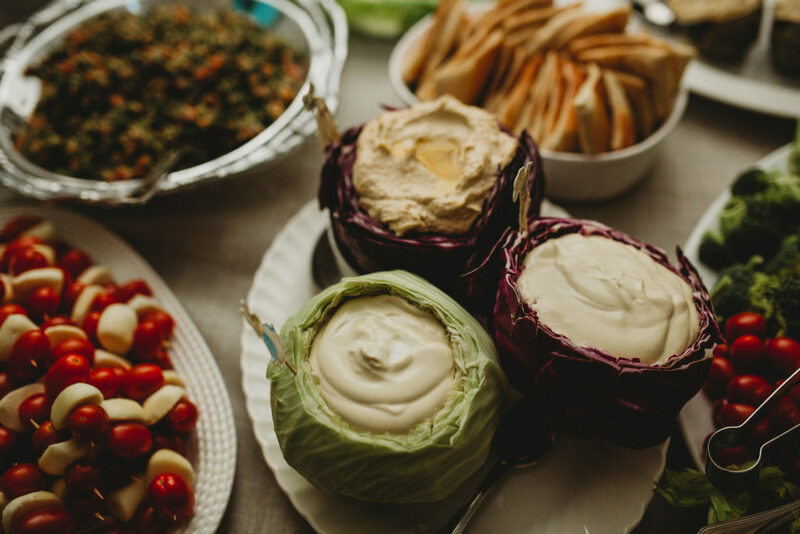 If you can, keep them all in the same color or in the same color family to help create that classic feel. If your mom kept an old pair of your shoes, these will look darling set out as decor. 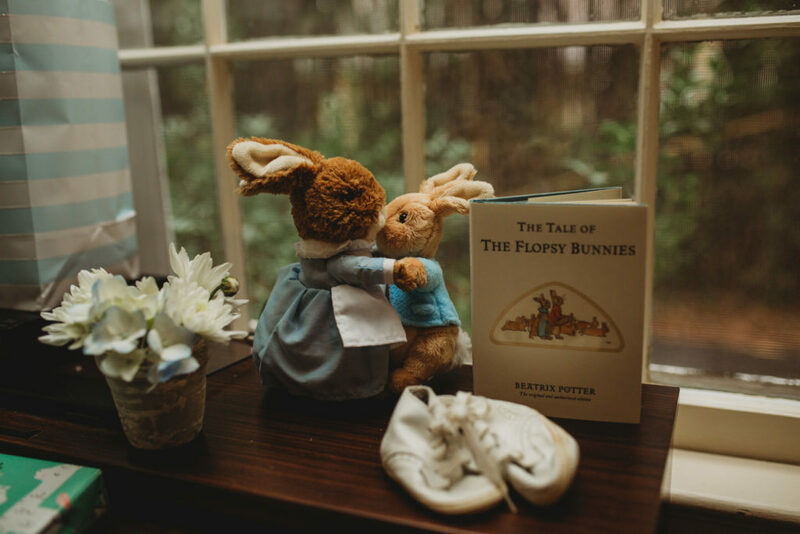 You can see they set up a little display with the shoes, some bunnies and flowers and another Beatrix Potter book, The Tale of the Flopsy Bunnies. 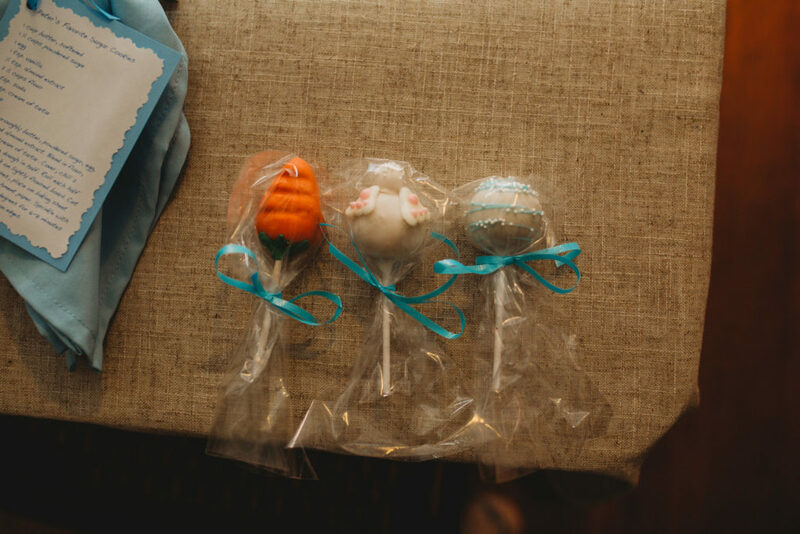 And finally, tie the storybook characters into your party favors! 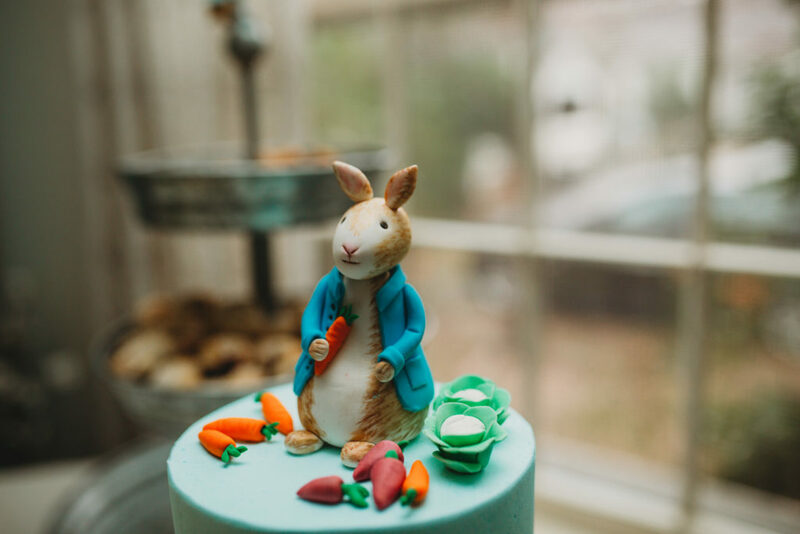 Alex and Peter’s guests were treated to rabbit shaped cookie cutters (which doubled as napkin rings at each place setting), carrot, rabbit and blue and white cake pops, and a recipe for Peter, the dad-to-be’s Favorite Sugar Cookies. 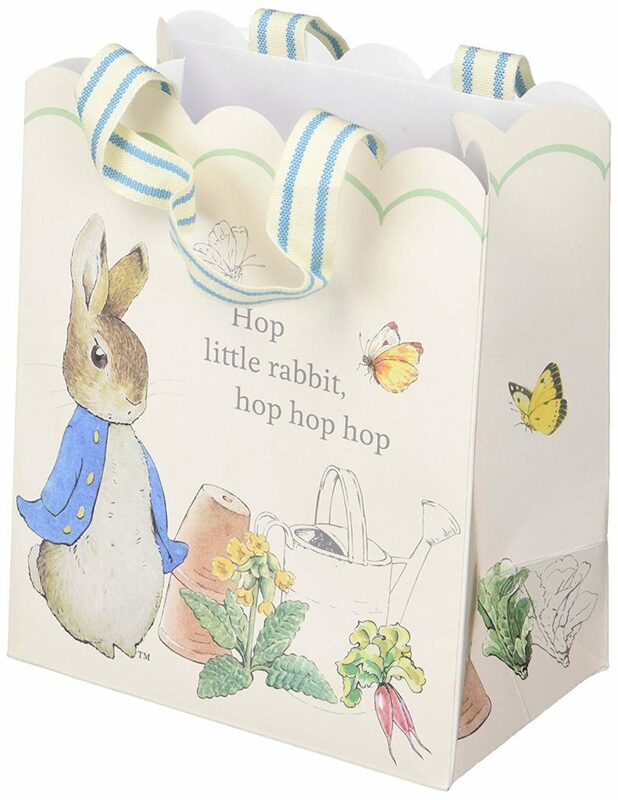 We also loves these vintage inspired Peter Rabbit Favor Bags that would be perfect for tucking a cookie, a bag of popcorn or some other treat inside! 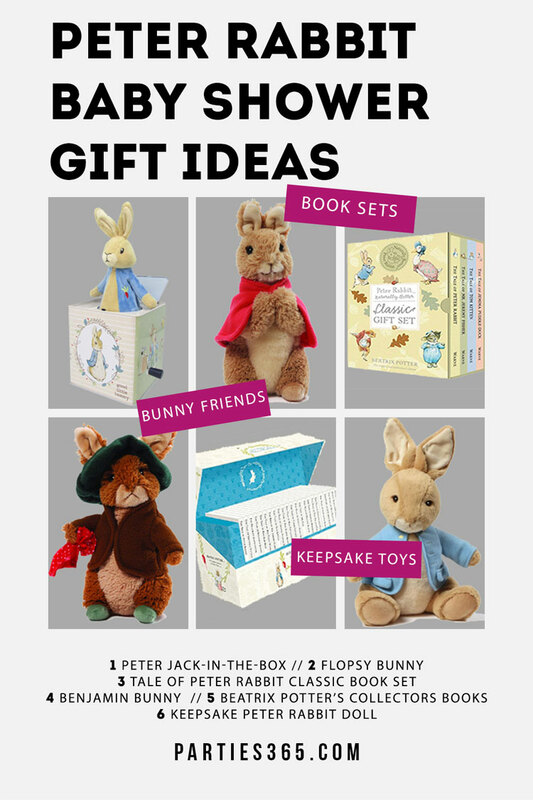 Finally, whether you’re throwing the shower or attending a Peter Rabbit Baby Shower (or other baby shower), you’ll need a gift for the soon to arrive baby! 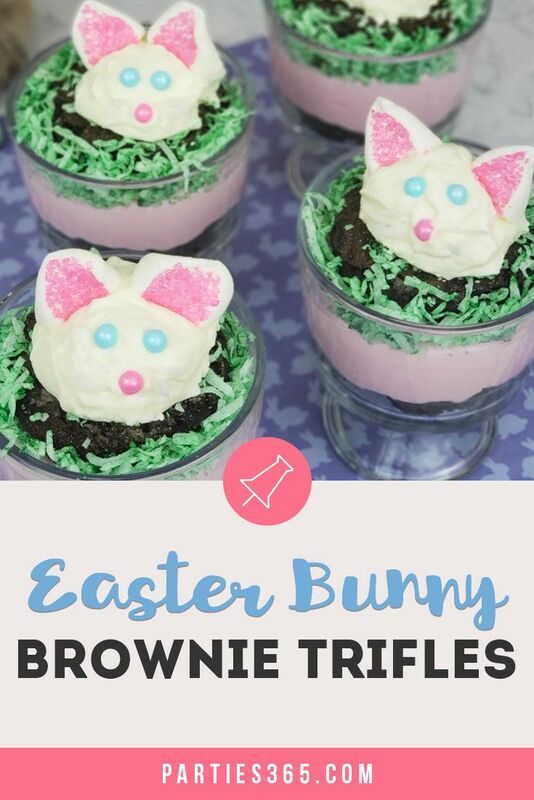 Here are a few ideas, keeping in line with this classic children’s book. 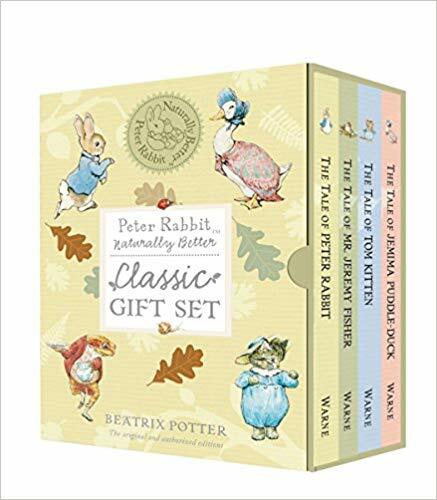 As you can see, you can take any classic storybook and use it for inspiration for your next baby shower! 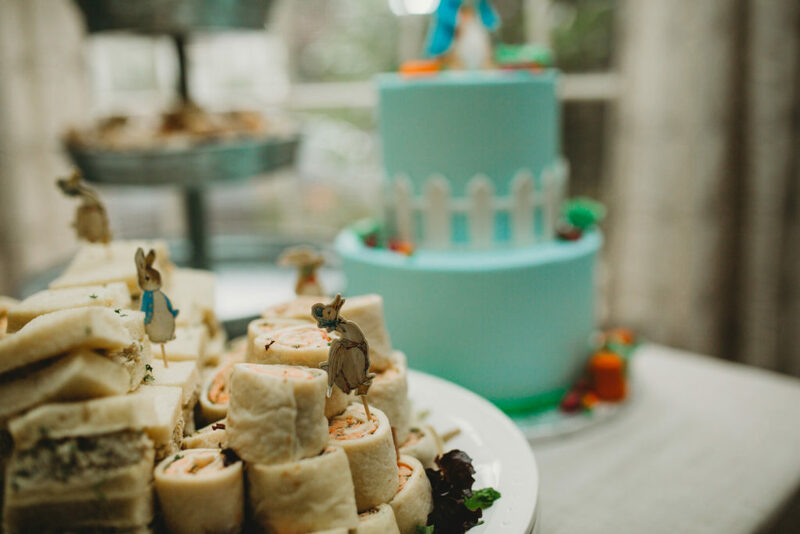 These 5 ways to incorporate the story and the characters are simple ways to bring fun and whimsy to this important celebration of new life! 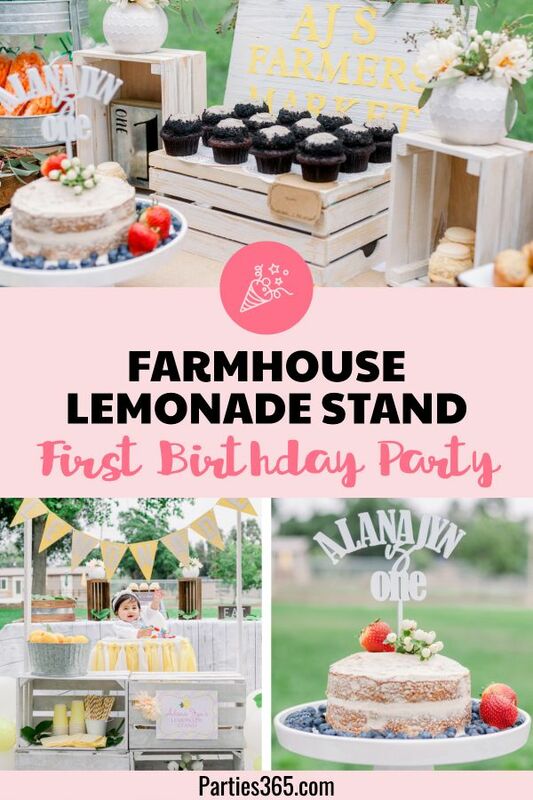 Be sure to pin this post for later inspiration as you plan your party!